In Georgia, we find a truly staggering diversity of life with over 4,400 species. Yet, we lead the nation in the number of species already lost to extinction and for those at risk of extinction. We have the unique opportunity to help reverse this trend for one iconic species in Georgia- the gopher tortoise. Here's how you can help. 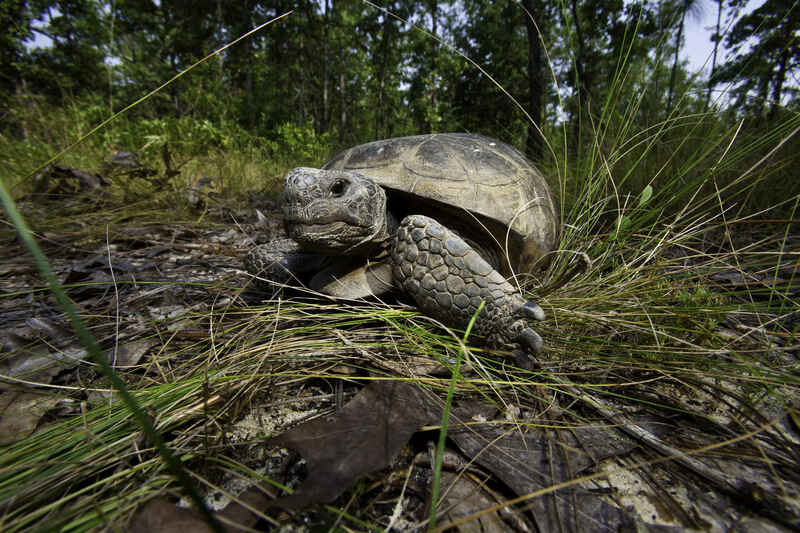 The gopher tortoise thrives in the sandy soils and grassy understories of the longleaf pine forest, an imperiled ecosystem reduced to only 5 percent of its original 90 million acres. The tortoise is a federal candidate species, meaning it should be listed under the Endangered Species Act (ESA), but is currently precluded due to other priority issues for the U.S. Fish and Wildlife Service (FWS). Gopher tortoises are considered keystone species because they dig burrows that provide shelter for hundreds of other species, including the eastern indigo snake, which is already federally listed as Threatened under the ESA. Within the Southeast, we are at a proverbial fork in the road. One route, taking no action, leads to a federal listing of the gopher tortoise which could have a negative impact in the region due to increased federal oversight of many sectors of the Georgia economy, including commercial growth, agriculture, timber, transportation and activities on military bases. The other route, investing in land to protect tortoise habitat that in some cases will provide public recreation land, requires creativity and action with the anticipated result being the avoidance of a federal listing. Protecting the gopher tortoise's habitat will also benefit people who depend on healthy longleaf pine forests for clean water, recreation and timber. The Gopher Tortoise Conservation Initiative (GTCI), a collaboration between the Georgia Department of Natural Resources, Georgia Forestry Commission, The Conservation Fund, The Georgia Conservancy, The Nature Conservancy, The Trust for Public Land, Orianne Wildlife Service and the U.S. Forest Service. By 2020, the GTCI aims to raise $150 million from state, federal and private sources to preserve and manage 65 viable gopher tortoise populations in Georgia and preclude the need to list the gopher tortoise. Once the populations are protected, the land must be managed and restored to a longleaf pine/native grass and herbaceous woodland community using controlled burning. We believe this action will protect enough habitat to preclude the need to list the gopher tortoise as well as the multiple other species being considered for federal listing that depend on this habitat type. An investment in this collaboration will go a long way towards protecting both the economic viability of the state and the multiple species of concern such as the gopher tortoise being considered for a federal listing. If we are not proactive and the tortoise is listed, people may ask why we didn't take action when we had time to do so. It is far more expensive to correct a problem than to take steps to avoid one.